The new largest private-sector employer in Macon County added 50 jobs to its payroll after an expansion to its West Macon plant. 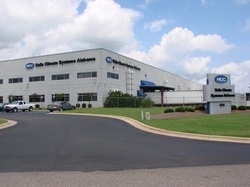 Hyundai and Kia auto plants supplier Halla Visteon Climate Control Alabama recently expanded its plant in Shorter by 30,000 square feet at a cost of $10 million. Fifty additional jobs to go with the expansion will bring the plant’s workforce to about 500. 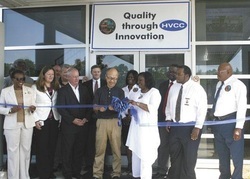 On Thursday, July 18, 2013 during the ribbon cutting ceremony, officials from the Town of Shorter and Halla Climate Systems talked about their collaborative efforts to make this second expansion happen. A token of appreciation was presented to Joo Seok Yoon, Managing Director of Halla Visteon Climate Control, by the Honorable Willie Mae Powell, Mayor of Shorter, Alabama. Also present were Alabama State Representative Pebblin Warren, Macon County's Economic Development consultant Joe Turnham, members of the Shorter Town Council and many others, who joined in celebrating the plant expansion.